Providing solar power to small businesses in rural Tanzania boosts profits and strengthens business. Check out the latest photos from a growing microfinance program in Isopilo, Tanzania. The Mama Bahati Foundation serves women in low-income communities across the southern highlands of central Tanzania. The farming village of Mtambula sits in the highland region of Iringa, Tanzania. There is a population of roughly 4,000 people, and like many places in East Africa, this is set to expand rapidly. At the time of writing, more than half of the community is school-aged. In 2015, Five Talents partner in Tanzania, Mama Bahati Foundation, identified Mtambula as an area for expansion. After a period of sensitization, they started a Trust Group with just five members. The program quickly attracted interest, and membership has spiked as the women begin to recommend the group to their friends and families. At the moment, average savings per person range from as little as Tsh 40,000 (about $18) to Tsh 100,000 ($45), which demonstrates the level of poverty in the area. Elizabeth Sanga joined the group after being persuaded by her neighbor. When asked why she joined, Elizabeth simply says that she was easily converted "due to the transformation I observed in my neighbors." "Before I joined MBF group I suffered from a shortage of capital, [I was] out of stock and was about to close the business. Our village is so far from town that financial institutions feel reluctant to provide financial services. We used to borrow money from money lenders with higher interest rates. But now we thank God for MBF because now we can get a loan with a very affordable interest rate." Elizabeth is a 26 year-old mother of three and a savvy businesswomen. Her children Josephine, Boniface, and Godfrey range from nine months to three years old, and when a member of the MBF team interviewed her, Elizabeth was also looking after her sister's two children. Elizabeth's eldest child, Josephine, has just started primary school. Twenty-odd years ago, Elizabeth was doing the same, but unlike her mother, Josephine will progress well past primary school. Elizabeth said that she doesn't "have plans for further education" but would rather "make sure" that her children receive higher education levels than she did. After getting two weeks of pre-loan training I received my first loan in March 2015, It was Tsh 200,000 ($90) The loan was used to purchase stocks for my shop. I even remember what it was, 5 cartons of bar soap, 1bag of sugar, 1 bag of wheat flour, and other small retails stocks." "My plan in future is to be the wholesaler in our village, I want to be a supplier to all of the retail shops within Mtambula and the nearby villages." Learn more about Five Talents programs in Tanzania. Special thanks to the MBF team and Five Talents UK for this interview and the accompanying photos. "My face portrays the happiness from my heart because I simply feel prestige being a member of Mama Bahati. It was a bit hard for me to join MBF as all know that the Maasai are not business people by nature." Katito (36) joined our Tanzanian partner organization, Mama Bahati Foundation (MBF), in 2014. As a women and a member of the Maasai tribe, Katito suffers from a wide-spread ethnic stereotyping that has to a large degree been internalized by the Maasai themselves. The Maasai have been nomadic pastoralists for thousands of years, and have had little opportunity or need to start small business. Now, as grazing lands are increasingly depleted, entrepreneurship is becoming a necessity. Despite the fact that times are changing, the Maasai and in particular the female members of the tribe are still seen as poor businesswomen. Katito's Trust Group consists of just five members located in Izazi Senta, 56km from Iringa town. Three years ago, her husband left town to find work, and hasn't been seen of since. Now, Katito is focused on covering her children's school fees. "The main business I am doing is food, but sometimes I supply fresh milk around the streets. For the short period I've been in MBF I managed to pay the school fees and other expenses for my three children who are studying at primary school. The business has been expanding day by day." In 2014, when Katito joined her local Trust Group, she had just Tsh 50,000 ($23). Since then, she has diligently saved small amounts which has, in turn, unlocked loan capital. As with all of the Five Talents programmes in Tanzania and Kenya, Katito's group received financial literacy training and business advice from the local Five Talents partners. Two years on, her savings have increased threefold. "I am not scared to ask for the much bigger loans because; MBF officers have been giving us much training on how to manage and develop our small businesses. Through the profit earned, I want to purchase a piece land so that I can build a good house for me and my children. Through MBF and their partners, I am sure my plans will became true. It's my advice for other Maasai ladies not to fear of taking loans for the business, the life has been changing, I am no longer dependent, I can do anything by myself. May God bless MBF and their partners to continue supporting low-income women in Tanzania." Here's an example of a micro-enterprise that has matured and expanded beyond what is sometimes called a "survival business." This stand in Iringa, Tanzania, is owned by a woman named Hamida and offers everything from soda pop to fresh fruit and vegetables. Hamida was one of the first clients of Five Talents' partner in Tanzania, Mama Bahati Foundation (MBF) having joined in 2006. Following the tragic death of her husband she had to find a way of supporting her children. After attending a local meeting and seeing how friendly it was she decided to join a group. She received business training and a first loan of $30. She used this loan to invest in her fruit and vegetable stall and pay for her son's school fees. Over the years Hamida's business has flourished and she now generates daily income of between $9-12. She saves some of this money and invests the rest in her business. She is now a trusted client and recently took out a loan of approx. $600. Hamida says she can really see the difference that the training and support make in her life. She can now meet all of her household expenses and send her children to school. Hamida plans to focus on making her one business stable before opening her own clothing line in the town. She also hopes to one day see the house that she started with her late husband completed. Photos by Adam Dickens for Five Talents. This photo by Adam Dickens captures Melina at work in her kiosk in Iringa, Tanzania. She is one of thousands of women who participate in weekly group meetings, where members can make savings deposits, borrow money and receive training in core business skills. Five Talents partners in Tanzania with the Mama Bahati Foundation (MBF), a local organization that was registered as an NGO in February 2006. One of the standout features of Five Talents' programs is the business skills training component. To find out more about Five Talents' work in Tanzania, please click here. 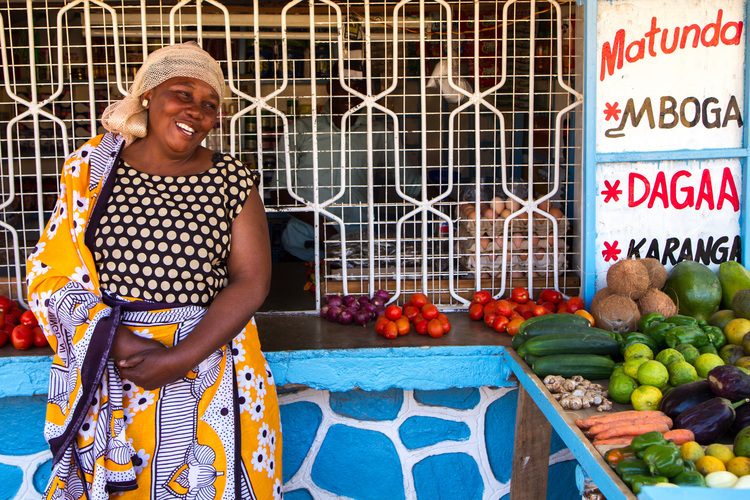 Zawadi runs a fruit and vegetable stall in Iringa, Tanzania. She uses the income generated from her business to support nine people in total, including her parents and her parents-in-law. 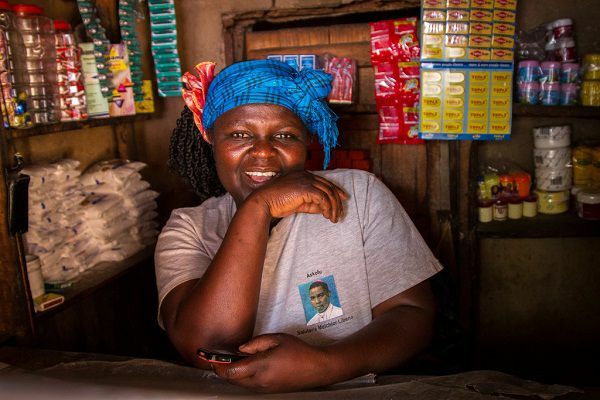 She said she would find it much harder to provide for all these people without the support she has received from the Mama Bahati Foundation that has helped her business to grow. 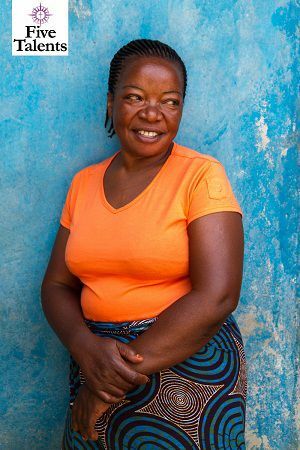 Carolina was among the first women served by Five Talents' partner in Iringa, Tanzania, the Mama Bahati Foundation (MBF). She attended the first training session conducted by Five Talents back in 2006. Initially, she did not take out a loan because she was already paying off one from another provider. Following the death of her husband in 2009, however, she decided to join MBF because she required a more manageable loan. Previously, she had been a housewife; now she needed to support her two children. Carolina has since developed two main businesses. For one, she keeps poultry. Presently, she has 32 hens and 4 roosters. They produce approximately 30 eggs per day, which she sells locally. More recently, she has also started a liquid soap business. She makes the soap in her house (approximately 10 liters per batch), packages it and then moves around her local area selling it. Carolina has also managed to make some additional income by renting part of her house to two families. Most importantly, she has witnessed a growth in profits in both businesses – especially with the soap. She has been targeting the large student population who live within the local community (a university is 5 km away). Carolina also employs a helper to assist her with her businesses. Carolina is in her 4th loan cycle, and her most recent loan of 200,000 Tsh ($125) was used to improve the cleaning process for her poultry project. She now feels that she is producing more nutritious eggs. She used one of her previous loans to purchase a sewing kit, which she used to produce and sell furniture coverings. Since joining Five Talents' local partner MBF, Carolina has learned to think on a much larger scale in terms of what she is capable of doing. She has also been able to share her experiences and lessons learned with the members in her savings and loan group. Lastly, she has been able to track improvements in her living standards. Carolina decided to join MBF, as opposed to other MFIs, based on the fact that MBF is better at listening to their clients, especially those who are struggling. She says that because of the group-based lending of loans, her other group members are located close by and so they can easily communicate with each other and provide advice about their loans, as well as act as a source of support when times are difficult. In terms of future plans, Carolina hopes to make a trademark label for her soap called "Rose Soap," which, if packaged properly, could help her sell the product more widely. Rukia in Tanzania wasn't about to take "no" for an answer. She had a hunch and she was going to see it through. For a while now, the 54-year-old mother of three children in the Anglican Diocese of Ruaha had been selling chapatti, a kind of flat bread that originated in India. But with her brother's passing, she had to begin taking care of his two children as well. And the income from her chapati business just wasn't enough to put her brother's kids through school. So Rukia had hatched a plan to start a second business – selling charcoal. Rising kerosene prices had given charcoal more appeal as a local energy source. The problem was that sellers like Rukia needed a permit from forestry officials to transport charcoal into town. These permits don't exactly grow on trees -- at least, not in Tanzania. But like a lot of determined entrepreneurs, Rukia kept pursuing the permit until, finally, it was awarded. She has since used loans from Five Talents and its partner, the Mama Bahati Foundation (MBF), to spark growth in the new business. Besides paying for her nephews' school needs, Rukia has enough money to cover their hospital bills. What's more, she has continued selling chapatti because, she says, that business introduces her to new customers for her charcoal business. She is now on her fourth loan cycle. As a Muslim believer, Rukia is discouraged from taking loans with interest. But she has continued with Five Talents and its partner MBF in part because of the low interest rates. "This makes Five Talents and MBF different from other MFIs, and this is why I am still with MBF," she told us. "Through [these] loans I have extended my support to my late brother's children and to my neighbors' who are in need." Click here to read more about Five Talents' program in Tanzania. In this photo, Hidaya is preparing the legumes that she uses for her pastry business in Tanzania. She sells her pasties at a nearby school and to others in her community. Before joining a savings and loan group with Five Talents' partner, the Mama Bahati Foundation, Hidaya could not afford to buy the legumes in bulk. Now, with the help of a loan, she is able to buy her ingredients in bulk and, thus, save money and increase her profit margin. Click here to read more about our work in Tanzania.